Stuart Family Chiropractic & Acupuncture Center is happy to offer Class IV Cold Laser Therapy as a comfortable, effective, non-invasive and drug-free technique for rehabilitating painful injuries and chronic conditions. It may all sound a little sci-fi, but laser therapy really works! The application of this specific low-level laser light penetrates deeply into muscles, ligaments, tendons and even bones to initiate cellular healing and regeneration. Cold laser therapy was once an exclusive treatment used by Olympic and professional athletes; but now we can offer the benefits of Class IV Cold Laser Therapy in Stuart Florida to our patients with back pain, neck pain, sprains, strains, arthritis, scar tissue and many other conditions. In some cases, laser therapy can even become an alternative to surgery. Cold laser therapy is a relatively new treatment. While the therapy has been around for more than forty years, the medical community has only begun to utilize it in the last 30 years. This non-invasive therapy is used to treat a wide variety of illnesses, including chronic back and neck pain. Here are a few of the most common questions we receive about Class IV Cold Laser Therapy, and answers from our Stuart Florida chiropractor. What is cold laser therapy in Stuart Florida? Cold laser therapy in Stuart Florida is a medical treatment that our chiropractor uses to enhance healing in our patients and speed injury recovery times. Cold laser therapy was invented in 1967 by a physician who was attempting to find a cure for skin cancer using his modified laser therapy. 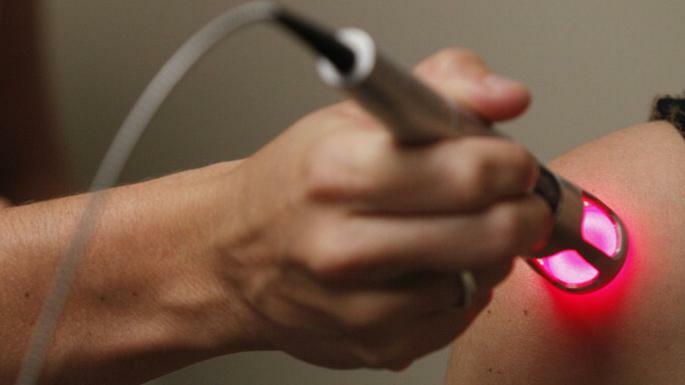 The therapy did not work for skin cancer, but the laser was found to encourage regeneration. Further studies by other researchers concluded that cold laser therapy is beneficial to individuals with arthritis and neck pain. Cold laser therapy is a non-invasive technique. It uses low level light pulses to stimulate healing and regeneration on a cellular level. There is little to no recovery time after the procedure, and pain relief and healing usually begin to occur after several treatments. It also does not involve the use of any medications and can, in fact, reduce your reliance on OTC and prescription pain killers. Cold laser therapy successfully treats arthritis, back and neck pain, sprains and strains of the back and joints, tendonitis, trigger finger, carpel tunnel syndrome, tennis elbow, fibromyalgia and injuries to the muscles and soft tissues of the body. Dr. Gonyo uses this therapy to enhance the effectiveness of chiropractic adjustments and speed recovery time of the injury. Is it true that cold laser therapy decreases healing times? Yes. Cold laser therapy does decrease healing times and lessen pain for some injuries and ailments. The wavelengths of light emitted from the medical device stimulate regeneration on a cellular level. This decreases inflammation, and stimulates the injured area into healing much faster than without the treatment. How do I know if I need cold laser therapy in Stuart Florida? Dr. Gonyo will perform a thorough physical evaluation when you come into our office. After the evaluation, he will recommend a course of treatment to heal your injury or treat your ailment, and it may include cold laser therapy. Circulation increases in the affected area, bringing fresh nutrients and oxygen to refresh and nourish the injured tissues. Damaged cells begin the regeneration process. Photoreceptors inside of damaged cells find the laser light stimulating. They start producing more adenosine tri-phosphate (ATP). ATP is primarily responsible for instigating cellular metabolism. In damaged cells, ATP is lacking and their metabolism shuts down. So the laser light essentially wakes up the cells and helps them start regenerating again. Improved cellular metabolism stimulates the production of collagen in the injured tissues, which helps improve the tone, elasticity and function of bones, muscles, ligaments and tendons. Pain relief—laser therapy also reduces painful inflammation in the injured tissues and stimulates the body to produce endorphins, which are the body’s very own painkillers. We have already helped many of our patients with our Class IV Cold Laser Therapy in Stuart Florida! This treatment modality has helped many of our car accident injury patients find relief as they are going through recovery from whiplash and other injuries. Our athletes have found it helpful in getting over sprains and strains more quickly. We have even been able to use laser therapy in conjunction with chiropractic spinal adjustments and spinal decompression therapy to help some of our patients with herniated discs and degenerative disc disease. We have even helped some of these patients avoid back surgery this way. We usually recommend an initial course of cold laser therapy treatments several times a week to spur the healing. After that, treatments can go down to a couple of times a week or a few times a month for maintenance. It simply depends on the patient’s condition and healing needs. Dr. Gonyo can talk with you about what course of action would be most helpful for your individual condition. To learn more about Class IV Cold Laser Therapy, or to schedule an appointment, please call us today at 772-781-0193.